Very few machines have lasted for more than a century without being rendered obsolete by something smaller, lighter and cheaper. It is the mandate of science to push technology to new levels of capability, so every generation will one day be able to start most conversations with their offspring’s offspring with: ‘back in my day…’ While often we roll eyes at grandad’s reminiscent tales of how he spent his evenings reading papyrus gazettes under the glow of kerosene lamps, we still accept that he probably used a car to get himself about. Some of us may actually drive that same car today. The automobile is an invention that has not fundamentally changed since it was first put together by Karl Benz in 1885. Today, as there was in the beginning, there is still an engine that sparks up and explodes crushed ancient marine creatures to push metal cylinders up and down. It is still through a complicated system of cogs and rods that the pyrotechnic-plankton energy finds its way to large wheels that rotate, and thanks to grippy rubber connecting to the ground, the wheels push the whole thing forward – including the person who directs the machine by way of a steering wheel. Over time, we’ve festooned our engine-driven wheeled vehicles with air conditioning (a machine that itself replaced giant blocks of ice), leather seats, MP3 players, push-rod suspension, parking sensors and heated-backside massagers – but the automobile itself has not yet been replaced. It is a machine that, despite its well-publicised polluting foibles – is essentially perfect. No-one has figured out a better way around. Even when the boffins crack hydrogen technology – or whatever efficient energy source they can get to power cars – the car itself will remain – the motor is just one part of thousands. Refinement has improved pretty each and every component of the automobile but one. From the very first motor-wagons in the late 19th century to today, we express our feelings via a carefully-positioned button at the helm of our machines, the horn. 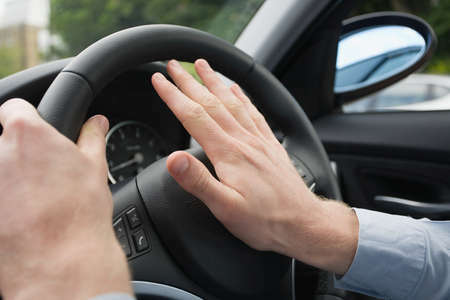 Over a hundred years later, we don’t have inter-vehicle intercoms, or electronic messaging systems – nope, all that’s changed is that the clamour from an angry motorist has gone from klaxon ‘awooga’s to ‘honk’s to ‘beep’s. In fact, early iterations of the car rolled off production lines, customers could choose between horns, bells or whistles, but predictably, the horn’s superior decibel count made it the clear favourite Ever since then, when somebody cuts sharply into your lane, and almost wipes the nose clean off your face, you don’t send a >L via intercar instant messaging systems – you lean on the horn and add some of your favourite four-letter words to the chorus. The horn alone is an ancient invention. We’ve grown up with car horns and instinctively know what they entail – depending on context. If you’re sitting in a lumbering procession of traffic and suddenly you hear a beep ring out from behind you, your first reaction is to panic and assume you’re the one in the wrong… your second reaction, once you realise it wasn’t you, is to join in the honking at the culprit…whoever they are.! Then, if you are in the wrong and you hear the horn you are expecting, you’ll straight away mutter something like ‘settle down you hot-headed jerk, jeez!’ before beginning a philosophical inner-monologue that life’s too short to be getting worked up about trivial matters and a relaxed attitude is best for all. That is until 100 metres later down the road, an elderly woman attempts to pull out in front of you and you immediately try to blast what’s left of her hearing with your modified air-raid siren, while condemning her to the foulest pits of hell. If you’re a pedestrian meanwhile, the sound of a horn will either prompt you to turn and wave, or dive into the nearest hedge for cover. It depends on whether you make friends or enemies, really. So, for 126 years, Benz’s dream remains, the loud button is still there and our predisposition to loud, merciless wrath on the roads hasn’t left either. I guess this makes us a pretty unimaginative, angry little lot, doesn’t it?